Internationally renowned writer, broadcaster and author Alan Jones has tirelessly reported on every aspect of Argento's career for more than three decades. 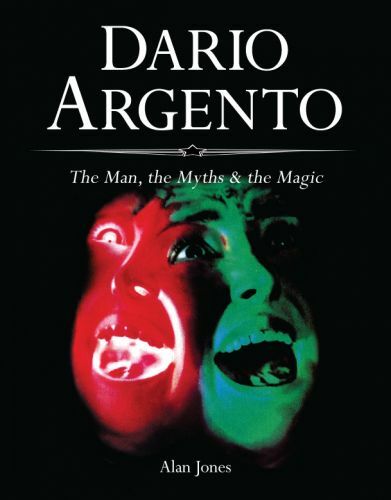 Every single feature, interview, review and in-depth look at Argento's multi-faceted universe was meticulously collated into one stunning, Sold Out volume, originally called Profondo Argento. Then in 2012 the book was made available again at last, this time under a new title and cover, Dario Argento: The Man, the Myths and the Magic. The re-issues featured a wealth of fresh material and interviews exclusively conducted for this exhaustive overview of Argento's extraordinary body of work. Illustrated with rare stills, posters and candid behind-the-scenes photos from the author's private collection, Jones probes deep into the psyche and methodology of one of the world's most celebrated genre directors - and in doing so also uncovers the luminous chaos of the entire Italian Film Industry itself. Issued yet again in 2016 with another new cover design, slick new binding, and all at a budget price! From his early beginnings scripting Sergio Leone's Once Upon a Time in the West, his directorial breakthrough with the chic giallo The Bird with the Crystal Plumage and his ground-breaking soundtrack use of the progressive rock group Goblin, to producing the gut-wrenching Dawn of the Dead, his Terror Trilogy with his Hollywood superstar daughter Asia and helming his latest thriller Dracula 3D, everything you ever wanted to know about Dario Argento but were afraid to ask is all here. Rarely has any journalist ever been granted such wide access to the life and work of his all-time favourite director. Yet that's precisely what happened to internationally renowned writer, broadcaster and author Alan Jones who won the respect of Dario Argento for his detailed location reports and critical assessments of the Italian Master of the Macabre. This book features full coverage of Argento's final film, Dracula 3D. Alan Jones was the sole London correspondent for the seminal ‘CFQ’ magazine from 1977 to 2002, reviewed every genre release for 'Starburst' between 1980 and 2008, was a featured film critic for ‘Film Review’ for two decades, contributed set-reports to ‘Fangoria’ for a decade and is currently a featured film critic in the 'Radio Times', the UK’s biggest selling magazine. He has been a member of the critic's jury at the Sitges (Spain), Fantasporto (Portugal), Paris, Rome, Strasbourg, Neuchatel (Switzerland), RazorReel (Bruges), Science+Fiction (Trieste, Italy), Motel X (Lisbon, Portugal), Fantastic Fest (Austin, Texas) and Avoriaz (France) fantasy festivals and, after co-presenting the legendary Shock Around The Clockfestival in London, and Fantasm at the National Film Theatre, is now co-curator of FrightFest, the UK’s biggest horror fantasy event. He most recently collaborated with Nicolas Winding Refn, the acclaimed director of the Pusher trilogy, Bronson, Valhalla Rising, Drive and Only God Forgives, on the lavish poster book Nicolas Winding Refn: The Act of Seeing, published by FAB Press, with whom he has also published The Frighfest Guide to Exploitation Movies.